When I was little, my mum and I used to make an annual pilgrimage to a bluebell wood. I was only young but I do remember a hazy sea of shimmering blue stretching as far as I could see. 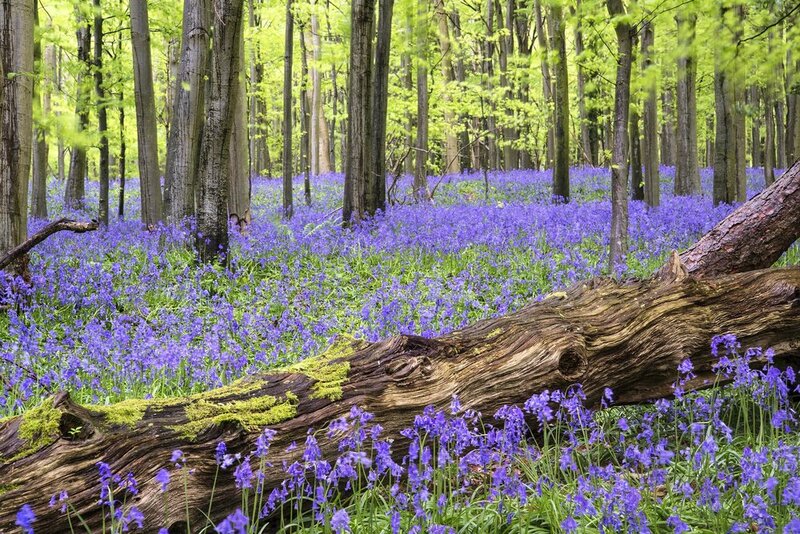 There’s something about a bluebell wood that sums up a British springtime. The National Trust says that half the entire world’s bluebells grow here in the UK, so they’re definitely ‘our’ flower! Their scent, a sort of musky, sweet smell of woodland flowers, is just beautiful. But bluebells have sparked controversy, thanks to an invader from abroad: the Spanish bluebell. This bluebell (Hyacinthoides hispanica) was first introduced to this country as a garden plant, but its rampant nature meant it soon escaped into the wild. The problem comes when the Spanish bluebells cross-breed with our native, English bluebells (Hyacinthoides non-scripta), producing hybrids. This has put our true native bluebells under threat, so much so that they’re now a protected species, making it illegal to dig up their bulbs in the wild. English bluebells are easy to spot as their flowers all hang down from the same side of the stalk. When fully formed, their weight pulls the stalk over to form the gentle, nodding curve so characteristic of bluebells. Spanish bluebells are larger, with upright flower stems. The flowers form all the way around the stalk, don’t have a scent and their leaves are thicker. If you’ve already got Spanish bluebells in your garden, unless you have native bluebell woods nearby (they need to be within reach of a bee), the Spanish ones won’t be able to hybridise with the English ones. If you want to get rid of yours, dig up the entire plant (bulb and leaves) and leave in the sun for at least a month to dry out so they’re completely dead, before you compost or dispose of them. If you want English bluebells, buy them when they’re in leaf, or as dry bulbs in autumn, and choose a reputable supplier so there’s no risk of them being illegally taken from the countryside, or of them being Spanish bluebells wrongly labelled as English. This bleeding heart is lovely in spring and forms a clump of ferny foliage topped by arching stems of pink heart-shaped flowers. Has amazingly bright golden yellow foliage that makes for a daring and exciting contrast with the magenta flowers.